On the rooftop of Europe: A visit to the Jungfraujoch puts a jewel in the crown of any visit to Switzerland. 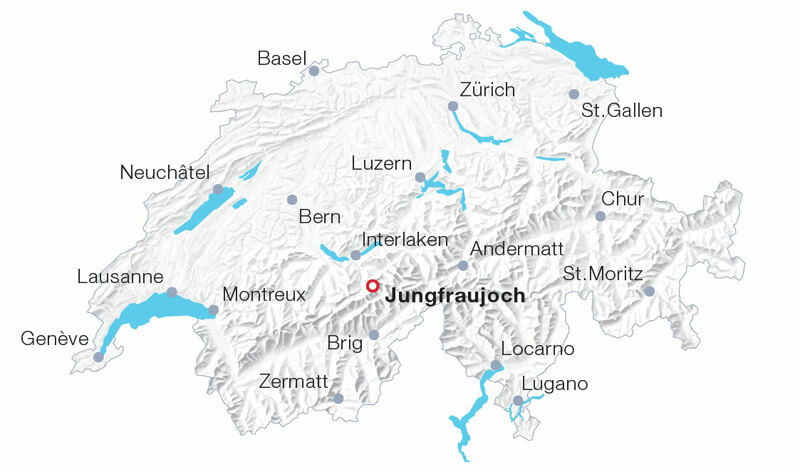 For more than 100 years, the Jungfrau railway has been making its journey to Europe’s highest-altitude railway station at 3,454 metres a.s.l. – right at the heart of the UNESCO heritage site “Swiss Alps Jungfrau-Aletsch”. All through the year, the cog railway runs steeply up through a tunnel to the Jungfraujoch from Kleine Scheidegg. The tunnel leading up from the station Eigergletscher is seven kilometres in length and was built between 1896 and 1912. A stop within the tunnel offers spectacular views onto the glacier world outside through windows in the Eiger North Face. On the summit, visitors are greeted by a high-Alpine wonder world made of ice, snow and rocks. All of this can be marvelled at from the viewing platforms “Sphinx” and “Plateau” on the Aletsch glacier or from the “Ice Palace”. Guests who like to go about their journey to Jungfraujoch in a completely relaxed manner can book a seat in advance. At a reservation fee of CHF 10, each passenger may book his or her seat (there and back) online. Operates 365 days a year, regular interval timetable (every 30 minutes). Holders of the Swiss Travel Pass (Flex) and GA travelcard get a 25% discount.